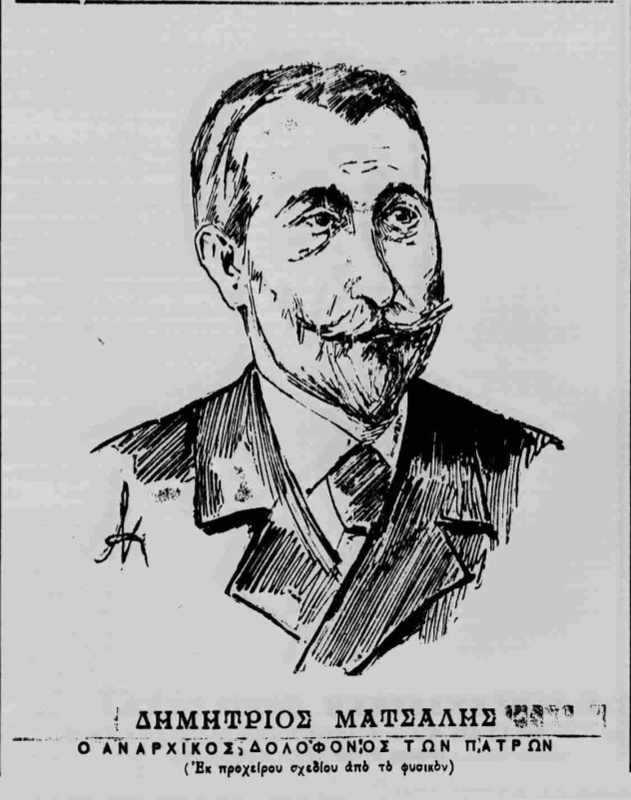 On 3 November 1896, in Patras, sandal-maker Dimitris Matsalis (or Matsanis, originated from Argos, a town of Eastern Peloponnese), who had attended the theatre play “William the Porter” which was played on in Patras at the time by an Italian troupe, and in which the power of wealth revealed outweighing any feeling of justice, attacked with a knife at Independence Avenue (todays Gerokostopoulos Street) against two renowned local figures. By his hits was killed on the spot the banker Dionysis Frangopoulos and seriously injured raisin trader Andreas Collas. Matsalis was immediately arrested and during the initial interrogation he explained clearly his anarchist ideas, saying: “I would kill Collas or anyone else. I have nothing with him, as I have nothing with Frangopoulos. But I am against this society’s inequalities and whoever was in front of me would pay for this …». The first interrogation of Dimitris Matsalis lasted several hours. There, he defended his ideas, saying: “What I did was for the sake of the idea. Nobody pushed me. I did it by myself. By killing them I didn’t aim to the particular people, but I struck Capital. I am an anarchist, and anarchists are for violence. Christogiannopoulos (1) and the other socialists are ridiculous and nothing links me with those. They want to impose their ideas by persuasion, while I, as an anarchist, support the terrorist violence”. On 6 November 1896, Dimitris Matsalis transferred to the prison in fortress of Patras. To the guards who accompanied him said: “I do not fear death. When I started to kill someone from this society, I knew that I would die at the end”. The event got an immense and huge publicity. Everyone everywhere began to see conspiracies. The time chronicler of the Athenian newspaper “Empros” (“Forward”) (2) Yiannis Kondylakis wrote ironically enough for the anarchist movement of Patras and the rural population of the region, while most journalists named the event “The tragedy of Independence Street”. “Neologos: What is your impression by the way the press wrote about your case? Are you unhappy? Matsalis: No. The press could not write otherwise. They completed their task. If we had anarchist newspapers would write differently! Neologos: You will not disappointed by the outcome of the trial whatever will be? At the same time other mainstream newspapers such as “Paligennesia” (“New Birth”, “Efimeris” (“Newspaper”), “Nea Efimeris” (“New Newspaper”) -all from Patras- “Skrip” from Athens and others, wrote several other theories on the anarchist and socialist ideas, making them responsible for crimes “against the country and its moral ethics”. On 8 November 1896. Dimitris Matsalis locked in an isolation confinement because of his propaganda to the other prisoners. According to some witnesses, the same day (according to others on 11 November) he committed suicide by biting a dynamite detonator, which is unknown who, how and when supplied to him. So, if we considering this evidence as true his trial never occurred, although it was clear that D. Matsalis would be convicted to death. Other historical sources, however, argued that Matsalis decapitated in the notorious at those times prison fortress Palamidi (in Nafplion). However, Matsalis’ act was the best opportunity used to the State to persecute wildly anarchists. Police arrested the most members and associates of the anarchist newspaper “Epi Ta Proso” (“Forward”), that is Yannis Magkanaras, Dimitris Karampilias, Tsekouras, Andreas Soufas, Evangellos Markantonatos, Panagiotis Kotzias, socialists Mourikis, D. Zafeiriadis, Vasilis Doudoumis, Tzoumerkas and others. The persecution extended to the christian socialist organisation “Armagedon” and had been arrested Athanassios Christogiannopoulos and Ioannis Arnellos as well. Dimitris Arnellos (brother of Ioannis) and some other anarchists fled away or passed to clandestinity. In Pyrgos anarchist Panos Machairas arrested (according newspapers “Neologos” and “Empros”, in 9 November 1896). Also, charges were addressed against prominent socialists of the time Stavros Kallergis and Plato Drakoulis. Overall, about 30 people arrested. Of those Doudoumis and Tzoumerkas freed without charges immediately. Police also raided “Epi Ta Proso” offices and seized the press machine, several documents, correspondence and other materials, while the same was done at the home of Yannis Magkanaras, where among other things confiscated was an article directed against the police ready to be published in “Epi Ta Proso”, which police tried to connect it directly with Matsalis’ act. Though this proved unsuccessful, because Magkanaras had written it when the police had accused him as an instigator of the strike of the sultana boxes manufacturers. Magkanaras led twice to a trial, where he defended his ideas. Meanwhile, from the newspapers, only “Peloponnese” stood in some kind of solidarity with those arrested, but was particularly critical against the christian socialist of “Armageddon”, going so far as to accuse its members as instigators of the murder of Frangopoulos. Conversely, the athenian newspaper “Acropolis” defended the move Christogiannopoulos while another athenian newspaper “Proia” stood against. Apart from Matsalis’ act it is historically confirmed that in Greece during this time there did not exist supporters of individual terrorism as happened until the first years of the 20th century in Europe. Most of the anarchists in Greece during1890’s, were basically supporters of anarchist communism of Kropotkin, Jean Grave and others. It seems that the only “representative” of the trend of individual terrorism in Greece was D. Matsalis, although others may wanted follow the path of theft and expropriation. It is also proven that Matsalis had not connection with “Epi Ta Proso”. In early May 1899, the daily newspaper “Neologos” in Patras began informing the readers of what was associated with a series of thefts and robberies, beginning with the theft against someone called Papandropoulos. The police started arrests and interrogations on the case and “Neologos” gave a wide publicity to them. The police arrested several people, while others were called to testify. Statements made also by the then Prime Minister Theotokis. Initially, among the various suspects and detainees whose names are paraded by the police was that of the anarchist Aristeidis Agallopoulos, a tailor by profession, who was from Constantinople. 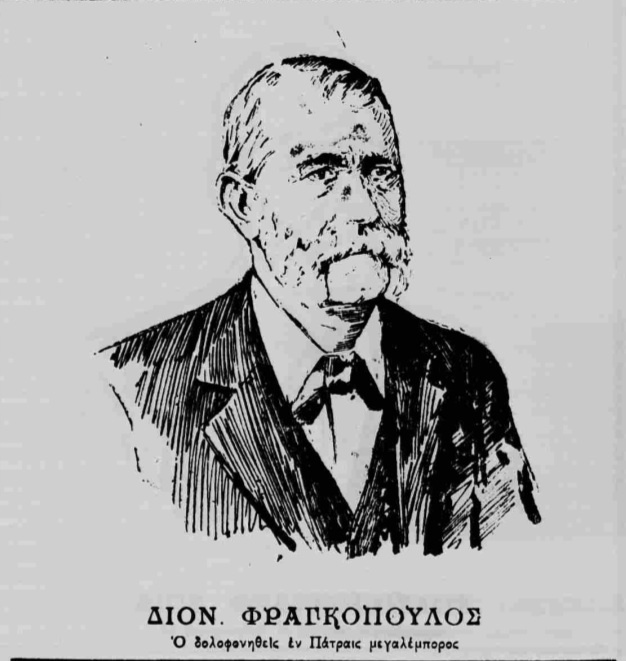 A. Agallopoulos was once a correspondent of the newspaper “Socialist” of Stavros Kallergis and later was among those ten anarchists who send an anti-electoral statement published in the anarchist newspaper of Pyrgos “Neon Fos” (“New Light”) in its No 17, 31 January 1899 issue. But as far as anarchists concerned one of the first names of the suspects in this case was this of Nicholas Liopetas, who participated in the gang and he was from whom that the “ball” of the whole case began unfold. Nicholas Liopetas, a carpenter by profession, was also one of the ten anarchists signed the anti-electoral statement to the “Neon Fos”. The arrest and discovery of the name of N. Liopetas as one of the main participants in this gang caused a great impression amongst the local society and also amongst anarchist and socialist groups and circles of Patras, because by many he was considered as a serious social activist. In Liopetas’s possession a bulky notebook found describing in detail all thefts by the gang members and various stolen property, especially valuables. However, we can say is that Liopetas’s participation and Agalopoulos’s assistance in the gang used by the State and the pursuing mechanisms to discredit the socialist anarchist ideas. But by the historical data we have got it must not be launched a massive crackdown against the already by this time weak anarchist group of Patras. But if we connect the morale blow with the assassination of Dimitris Bantounas – that took place during the arrests of the members of the gang – was the swan song of anarchist activity in Achaia and Ilia. Most of the participants of this significant ascent and descent of the anarchist wave of class struggle in Achaia and Ilia Prefectures migrate in Athens, others settle abroad, and some others simply disappear. The views on when and how Dimitris Bantounas died are still today divided. “Neologos” wrote in 18 May 1899 that there was an armed conflict between Bantounas and Dimoulias brothers in Pyrgos and that one of them killed Bantounas after the latter smacked one of their relatives. 1. Athanassios Christogiannopoulos. A prominent christian socialist intellectual in Patras and leader of Armageddon grouping during the last years of 19th and first years of 20th century. 2. “Empros”. We must not confuse this newspaper with a short lived anarchist publication by the same name circulated in Patras around 1895-1896.